Near Kitty Hawk, North Carolina, Orville and Wilbur Wright make the first successful flight in history of a self-propelled, heavier-than-air aircraft. 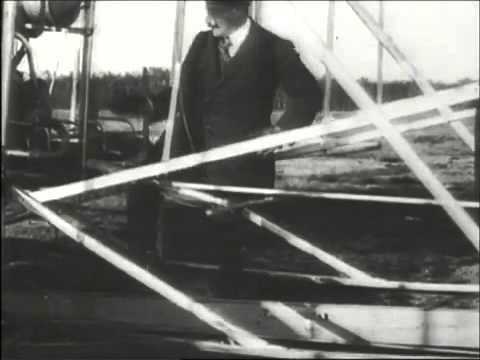 Orville piloted the gasoline-powered, propeller-driven biplane, which stayed aloft for 12 seconds and covered 120 feet on its inaugural flight. Orville and Wilbur Wright grew up in Dayton, Ohio, and developed an interest in aviation after learning of the glider flights of the German engineer Otto Lilienthal in the 1890s. Unlike their older brothers, Orville and Wilbur did not attend college, but they possessed extraordinary technical ability and a sophisticated approach to solving problems in mechanical design. They built printing presses and in 1892 opened a bicycle sales and repair shop. Soon, they were building their own bicycles, and this experience, combined with profits from their various businesses, allowed them to pursue actively their dream of building the world’s first airplane. After exhaustively researching other engineers’ efforts to build a heavier-than-air, controlled aircraft, the Wright brothers wrote the U.S. Weather Bureau inquiring about a suitable place to conduct glider tests. They settled on Kitty Hawk, an isolated village on North Carolina’s Outer Banks, which offered steady winds and sand dunes from which to glide and land softly. Their first glider, tested in 1900, performed poorly, but a new design, tested in 1901, was more successful. Later that year, they built a wind tunnel where they tested nearly 200 wings and airframes of different shapes and designs. The brothers’ systematic experimentations paid off–they flew hundreds of successful flights in their 1902 glider at Kill Devils Hills near Kitty Hawk. Their biplane glider featured a steering system, based on a movable rudder, that solved the problem of controlled flight. They were now ready for powered flight. In Dayton, they designed a 12-horsepower internal combustion engine with the assistance of machinist Charles Taylor and built a new aircraft to house it. 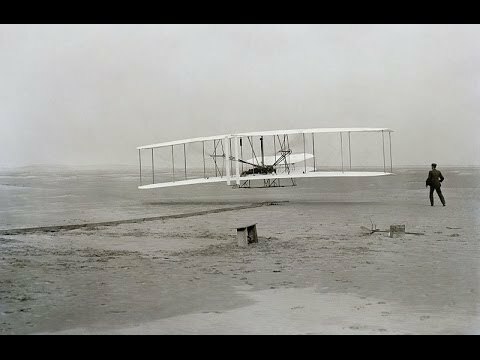 They transported their aircraft in pieces to Kitty Hawk in the autumn of 1903, assembled it, made a few further tests, and on December 14 Orville made the first attempt at powered flight. The engine stalled during take-off and the plane was damaged, and they spent three days repairing it. Then at 10:35 a.m. on December 17, in front of five witnesses, the aircraft ran down a monorail track and into the air, staying aloft for 12 seconds and flying 120 feet. The modern aviation age was born. Three more tests were made that day, with Wilbur and Orville alternately flying the airplane. Wilbur flew the last flight, covering 852 feet in 59 seconds. During the next few years, the Wright brothers further developed their airplanes but kept a low profile about their successes in order to secure patents and contracts for their flying machines. By 1905, their aircraft could perform complex maneuvers and remain aloft for up to 39 minutes at a time. In 1908, they traveled to France and made their first public flights, arousing widespread public excitement. In 1909, the U.S. Army’s Signal Corps purchased a specially constructed plane, and the brothers founded the Wright Company to build and market their aircraft. Wilbur Wright died of typhoid fever in 1912; Orville lived until 1948. The historic Wright brothers’ aircraft of 1903 is on permanent display at the National Air and Space Museum in Washington, D.C.